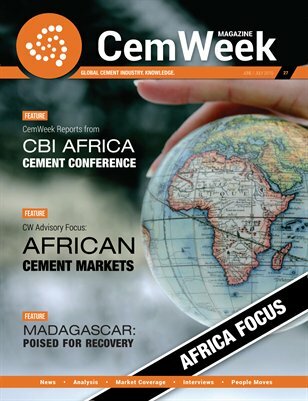 The 27th issue of CemWeek Magazine provides in depth features about the trends and developments of the cement industry in Africa, ranging from market analyses, news and updates, to coverage about one of the largest industry events. CW Advisory focus: African cement markets The dedicated feature about the region’s strengths and opportunities outlines some of the most pressing questions for an industry which is facing a steep increase in cement output. Madagascar poised for recovery The Madagascar cement industry is expecting to see a slight improvement in market conditions in 2015 based on stabilization of the political outlook after the presidential elections of late 2013 which put an end to a political crisis that has been clogging the economy for several years. CemWeek reports from CBI Africa cement conference CemWeek had the opportunity to support and be a participant in the Cement Business & Industry (CBI) conference and exhibition, organized in South Africa on June 25-26.